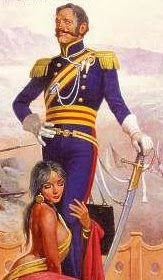 Flashman on learning foreign languages: … if you wish to learn a foreign tongue properly, study it in bed with a native girl – I’d have got more out of the classics from an hour’s wrestling with a Greek wench than I did in four years from Arnold. Flashman sums up the leadership ability of General Elphinstone: Only he could have permitted the First Afghan War and let it develop to such a ruinous defeat. It was not easy: he started with a good army, a secure position, some excellent officers, a disorganised enemy, and repeated opportunities to save the situation. But Elphy, with a touch of true genius, swept aside these obstacles with unerring precision, and out of order wrought complete chaos. We shall not, with luck, look upon his like again. Flashman on an odd Victorian England custom: It was a common custom at that time, in the more romantic females, to see their soldier husbands and sweethearts as Greek heros, instead of the whore-mongering, drunken clowns most of them were. However, the Greek heros were probably no better, so it was not so far off the mark. This entry was posted in Lit and tagged Flashman, Harry Paget Flashman by Sir Edward Percival Fox-Ingleby, Bt. Bookmark the permalink.